A thrilling Covert-One novel, from the world's No. 1 bestselling international author. 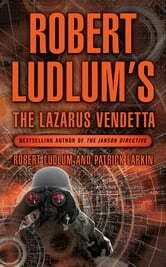 In the increasingly turbulent atmosphere of international politics, a once grassroots anti-globalisation movement has been slowly taken over by an underground radical anti-technology group fronted by a mysterious figure known only as Lazarus. All attempts to infiltrate the group have failed, and the intelligence agents involved have disappeared without trace. Now Lazarus is preparing to make his boldest move yet. Lt Col. Jon Smith is activated by Covert-One to bring his skills to bear in uncovering the truth behind the terrorists. For, unbeknown to the world at large, the Lazarus Movement is on the brink of setting in motion a deadly scheme that will risk the lives of billions and for ever change the nature of the world.